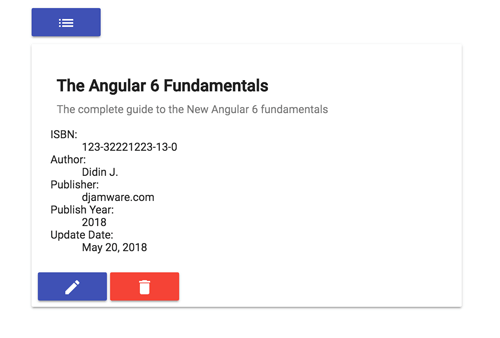 The comprehensive step by step tutorial on building MEAN Stack (Angular 6) Create-Read-Update-Delete (CRUD) Web Application. In this MEAN Stack Angular 6 tutorial we will be focused in the new feature in Angular 6 that support CRUD operation. Start from RESTful API access to UI/UX using Angular 6 Material, it different than previous MEAN Stack tutorial. We assume that you have installed Node.js. Now, we need to check the Node.js and NPM versions. Open the terminal or Node command line then type this commands. That's the Node.js and NPM version that we are using. Now, you can go to the main steps. To install or upgrade the latest Angular 6 CLI, type this command in the terminal or Node command line. If you use windows, it might be not necessary to add `sudo`. Next, create a new Angular 6 Web Application using this Angular CLI command. Next, go to the newly created Angular 6 project folder. Now, run the new Angular 6 web application using this command. Open the browser then go to this address `localhost:4200` and you will see this page. Close the running Angular 6 app first by press `ctrl+c` then type this command for adding Express.js modules and its dependencies. Then, add bin folder and a `www` file inside the `bin` folder. To make the server run from `bin/www`, open and edit `package.json` then replace `start` value. Now, create `app.js` in the root of the project folder. Open and edit `app.js` then add all these lines of codes. Open and edit `routes/book.js` file then add this lines of codes. 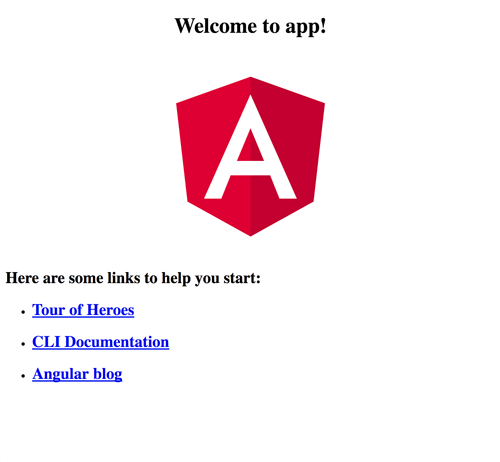 You will see the previous Angular landing page when you point your browser to `http://localhost:3000`. When you change the address to `http://localhost:3000/api` you will see this page. Now, we have RESTful API with the compiled Angular 6 front end. We need to access data from MongoDB. For that, we will install and configure `Mongoose.js`. On the terminal type this command after stopping the running Express server. Open and edit `app.js` then add this lines after another variable line. Now, run MongoDB server on different terminal tab or command line or run from the service. Next, you can test the connection to MongoDB run again the Node application and you will see this message on the terminal. Add a models folder on the root of the project folder for hold `Mongoose.js` model files. Now, open and edit that file and add Mongoose require. Then add model fields like this. That Schema will mapping to MongoDB collections called book. If you want to know more about Mongoose Schema Datatypes you can find it here. Next, export that schema. Open and edit again `routes/book.js` then replace all codes with this. Run again the Express server then open the other terminal or command line to test the Restful API by type this command. Now, let's populate Book collection with initial data that sent from RESTful API. Run this command to populate it. You will see this response to the terminal if success. To create Angular 6 Routes for navigation between Angular 6 pages/component, add or generate all required component. Next, open and edit again `src/app/app.module.ts` then add this import. Add this lines of codes for Angular routes before `@NgModule`. In @NgModule imports, section adds ROUTES constant, so the imports section will be like this. To activate that routes in Angular 6, open and edit `src/app/app.component.html` then replace all codes with this. Before creating a service for RESTful API access, first, we have to install or register `HttpClientModule`. Open and edit `src/app/app.module.ts` then add this import. To create Angular 6 service, simply run this command. Next, open and edit `src/api.service.ts` then add this imports. Add these constants before the `@Injectable`. Inject `HttpClient` module to the constructor. Add the error handler function. // A client-side or network error occurred. Handle it accordingly. // The backend returned an unsuccessful response code. Add a function for extract response data. Add all CRUD (create, read, update, delete) functions of books data. We will display a book list that gets via API Service. For that, open and edit `src/app/book/book.component.ts` then add this imports. Next, inject the API Service to the constructor. Add a variable for hold books list before the constructor. Modify the `ngOnInit` function to get book list immediately. Next, for user interface (UI) we will use Angular 6 Material. There's a new feature for generating a Material component like Table as a component, but we will create or add the Table component from scratch to existing component. Type this command to install Angular Material. We will register all required Angular Material components or modules to `app.module.ts`. Open and edit that file then add this imports. Also, modify `FormsModule` import to add `ReactiveFormsModule`. Register the above modules to `@NgModule` imports. Next, back to `src/book/book.component.ts` then add this imports. Declare the variables of Angular Material Table Data Source after the books variable. Add a class for the Book Data Source. Next, open and edit `src/book/book.component.html` then replace all HTML tags with this Angular Material tags. Finally, to make a little UI adjustment, open and edit `src/book/book.component.css` then add this CSS codes. To show book details after click or tap on the one of a row inside the Angular Material table, open and edit `src/book-detail/book-detail.component.ts` then add this imports. Inject above modules to the constructor. Declare a variable before the constructor for hold book data that get from the API. Add a function for getting Book data from the API. Call that function when the component is initiated. For the view, open and edit `src/book-detail/book-detail.component.html` then replace all HTML tags with this. Finally, open and edit `src/book-detail/book-detail.component.css` then add this lines of CSS codes. To create a form for adding a Book, open and edit `src/book-create/book-create.component.ts` then add this imports. Declare variables for the Form Group and all of the required fields inside the form before the constructor. Add initial validation for each field. Create a function for submitting or POST book form. Next, open and edit `src/book-create/book-create.component.html` then replace all HTML tags with this. <input matInput placeholder="Published Year" formControlName="published_year"
Finally, open and edit `src/book-create/book-create.component.css` then add this CSS codes. We have put an edit button inside the Book Detail component. Now, open and edit `src/book-edit/book-edit.component.ts` then add this imports. Declare the Form Group variable and all of the required variables for the book form before the constructor. Next, add validation for all fields when the component is initiated. Create a function for getting book data that filled to each form fields. Create a function to update the book changes. Add a function for handling show book details button. Next, open and edit `src/book-edit/book-edit.component.html` then replace all HTML tags with this. Finally, open and edit `src/book-edit/book-edit.component.css` then add this lines of CSS codes. Inside book detail component, you have seen there a button for delete and have click action to a function. Now, open and edit `src/book-detail/book-detail.ts` then modify the `ActivatedRoute` import to add `Router` module. Inject `Router` to the constructor. Add this function for delete book. Now, it's a time for testing the MEAN Stack (Angular 6) CRUD Application. In the browser go to this URL `localhost:3000` and here the whole application looks like. 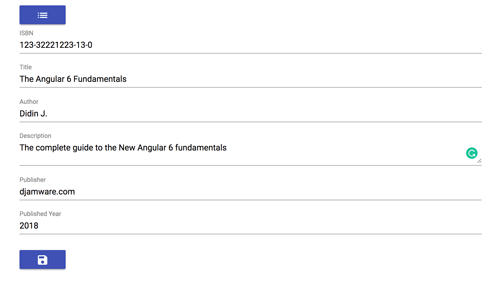 That it's, we have finished the complete tutorial of MEAN Stack (Angular 6) and Angular Material. If you can't follow the steps of the tutorial, you can compare it with the working source code from our GitHub.